I am so feeling back to myself with my style recently. 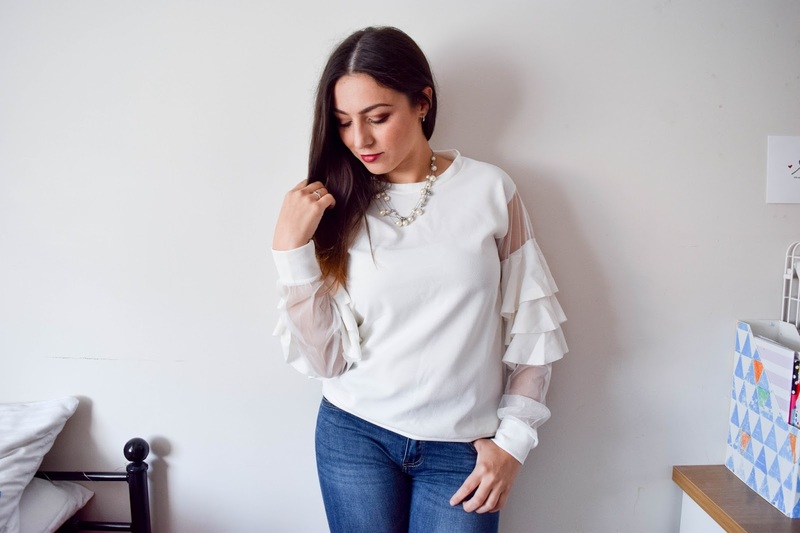 In my wardrobe I've rediscovered some much loved pieces and I've also had a couple of additions that have made a huge difference to my current style. With autumn and winter just around the corner, I'm thinking about warmer clothes, layering up and finally being able to shop things that aren't cropped or low-cut. Bring on the autumnal style because I'm here and all for it! 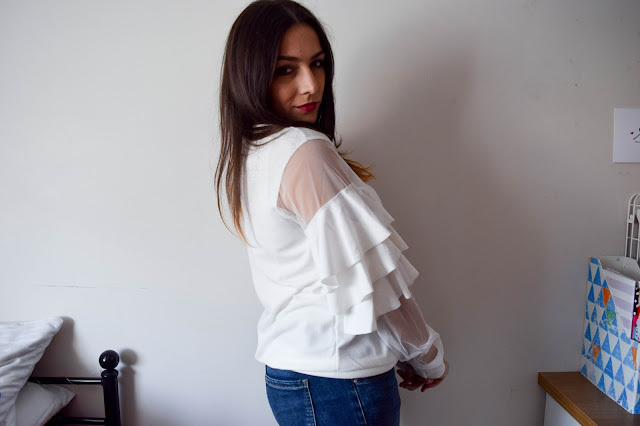 Today I want to share with you my latest outfit from LOTD.co.uk. I've been lucky enough to collaborate with them on this post today and I'm living for this outfit!!! I cannot tell you just how much I love this top right now. The sweater style has always been a favourite but I love how different and out of the box this one is. 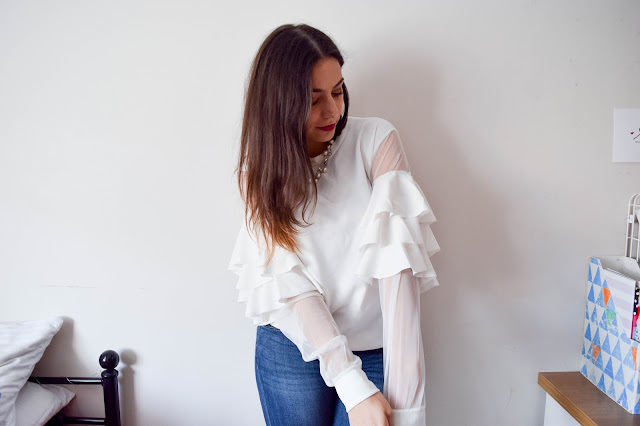 I love the sheer sleeves, I love the frills and I love that it's all one colour. It's simple but bold and just so pretty and alternative. I've not had it very long but I've got a bunch of outfit ideas in my head that might be a bit over the top or might just work in the best way possible. 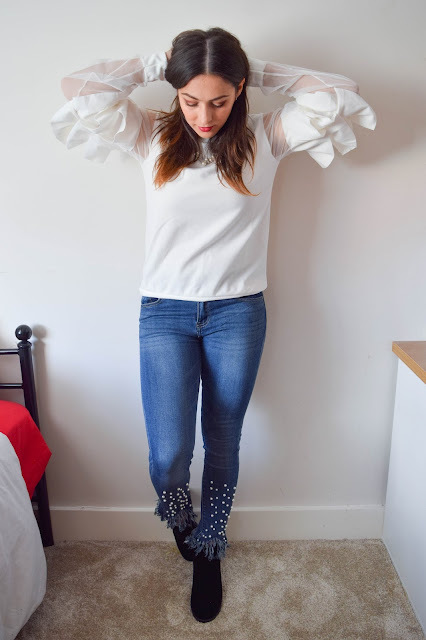 When I was styling my outfit online, I decided a nice pair of jeans would make this outfit really lovely. Keep it simple but cool you know? And so, I got something a little outside my box when it comes to jeans too. I was going all out with the statement things that day! Pearly jeans! Okay, so when I first saw the whole pearled jeans I didn't get it. I didn't really think much of it to be honest and the idea of things on my jeans was just odd to me. 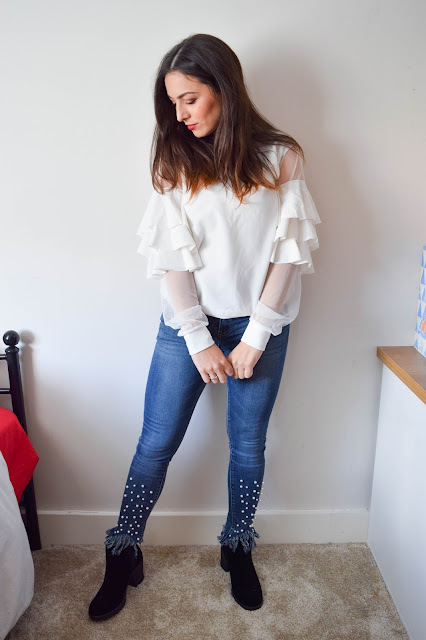 But when I saw these jeans styled on the website, I fell for them and just had to go for it! I love the frayed hems, I love the pearls and I love the colour too. I'm so done with ripped knees and I loved that this is so different to anything in my wardrobe right now. A simple pair of jeans with some statement detailing. Perfect for jazzing up ANY casual look! Last but not least, I also got the boots from LOTD.co.uk and I'm obsessed already. I've been wearing them everyday since they arrived and I adore how comfortable they are to wear, how well they fit and how versatile they are. I first expected some matte suede style boots but these are actually a little softer and more on the shiner side too. I like that.They're a deep black too and the elastic Chelsea boot style band makes it so easy to slip on and off when needed. It's hard to see in the photo but they are very lovely. You know, although I'm collaborating with LOTD.co.uk on this post today I was sceptical about the products and their quality. I'd only heard of the brand via Facebook ads once before and I didn't know what to expect. I was worried about lots of things with these products. 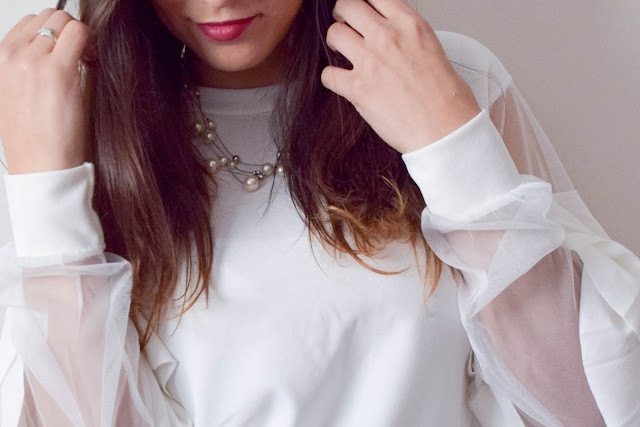 Would the sheer sleeves rip or tug easily? Is the top see-through as a lot of white things are? 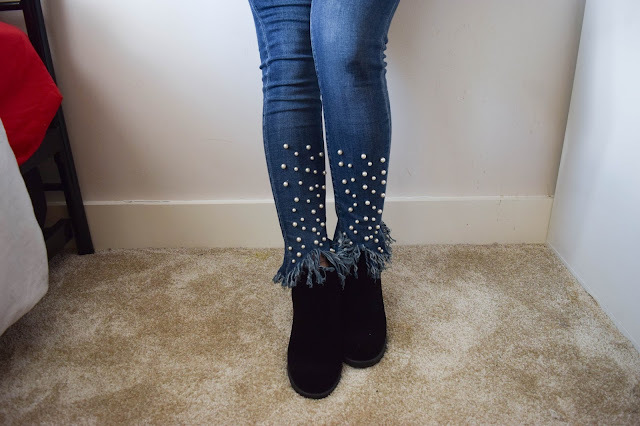 Would the pearls fall off the jeans? Would the jeans fit? Would my boots fit uncomfortably? I was totally wrong about all of these things. First of all, the top is so well made. It withstood the rolling up of sleeves easily, it hasn't pulled or got caught anywhere and it's not see-through at all which I'm over-the-moon about! 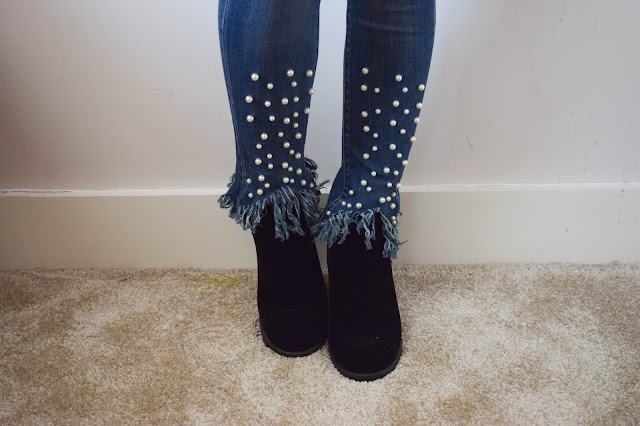 As for the jeans, the pearls are pressed on the denim with a stud gun rather than sewn on as I expected meaning they're on there for good and won't come off in the middle of wearing them or the wash. And as for the boots, they're comfortable and though a little big, it works for me as I like wearing thicker socks with my boots. Overall, I've been a total winner with the entire outfit and I'm so pleasantly surprised and happy with what I have. I can't wait to wear these pieces out again together and separately too. That's my favourite thing about clothes - the versatility even if they are amazing statement pieces too. I'm definitely shopping here in the future, especially over other online stores. I can vouch that delivery is super quick and easy too which is always a winner when online shopping. I can't wait to see what else they have in store for autumn/winter! Have you ever heard of or shopped LOTD.co.uk? Hat top is so nice on you Cat! I'd love to have a go at styling up some jeans like this! 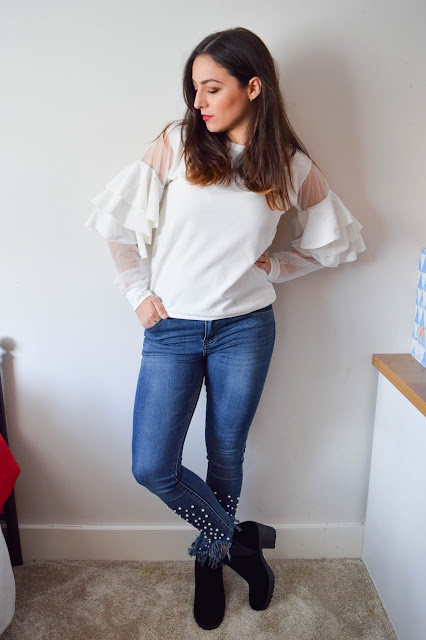 I'm dying to try the frayed hem on jeans trend but can't find the right pair for me yet! Love the tip, such nice sleeves! This whole outfit is just beautiful! Those jeans suit you so well, they're not something I'd be able to pull off but they look great on you. That top is just beautiful, and like you said it's going to work in so many ways. I might just have to invest in it myself! I've never heard of LOTD.co.uk, but I've just had a quick look and I'm quite interested in what they've got!